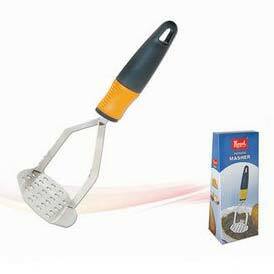 We are the chief Manufacturers, Suppliers, and Exporters of Potato Masher in Rajkot, Gujarat, India. We manufacture it by using the finest raw materials and sophisticated techniques. We offer it to various canteens, hotels, and restaurants. It is well-accredited by our clients for having a perfect finish, high durability, optimum functionality and long-lasting life. Our quality analysts thoroughly examine the entire range on the basis of the stringent quality parameters, to deliver a high-quality product to our prestigious clients.